I associate tea time with a nice, hot cup of tea with a snack to go with it. If you are looking to make a quick yet nutritious snack at tea time, you can consider making Oats Moong Toast. 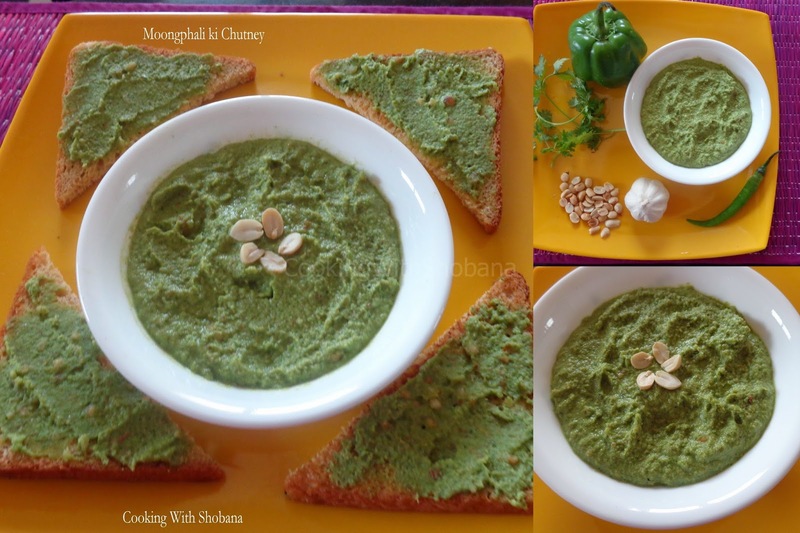 I found another delicious combination when I made toasts with Moong Phali ki Chutney ( Peanut Chutney) adapted from Sanjeev Kapoor Khazana's YouTube version. You can either lightly toast the bread as I did or make plain sandwiches. To enhance the health factor, you may like to use brown bread. Roast the peanuts, allow them to cool and de-skin them. Keep aside. Wash the coriander leaves and keep aside. Finely chop the green capsicum. Keep aside. In a grinder, combine the roasted peanuts with the coriander leaves, finely chopped green capsicum, chopped green chillies, and garlic cloves.